Join for a dance party after your Valentine’s Day Dinner with that special someone, this Thursday at 9 pm. 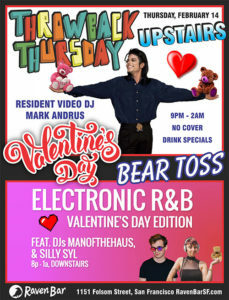 Upstairs – Resident video DJ Mark Andrus spins Throwback Hip Hop, Pop, & R&B Music Videos. Downstairs – Guest DJs Manofthehaus & Silly Syl spin Electronic R&B Music. Teddy Bear Toss on both floors + Complimentary professional green screen photo booth, streaming photos live to Raven’s Facebook page.